Tal won the world championship title from Botvinnik in 1960 but lost the return match. Before this return match, Tal became unwell with kidney trouble but refused to postpone play. He eventually lost one of his kidneys and was never really well afterward. Nevertheless, from 1949 to 1990, Tal played in 55 strong tournaments, winning or sharing 19 first and 7 second prizes. He won six Soviet championships, which were some of the strongest tournaments of that time. He also compiled a record of 59 wins, 31 draws, and only 2 losses in seven Olympiads. Famous for his intimidating stare, Tal joins José Raúl Capablanca and Bobby Fischer (both discussed earlier in this chapter) as the most feared opponents in history. When playing Tal, players were always afraid of winding up on the losing side of a soon-to-be-famous game. In the position shown here, Tal is white against Hungarian Lajos Portisch in 1965, at the time one of the world’s elite grandmasters and a frequent candidate for the world championship. 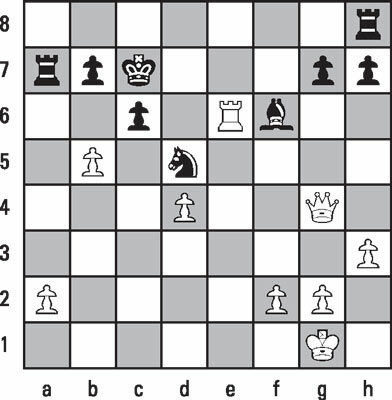 White’s (Tal’s) bishop on d3 is attacked by black’s (Portisch’s) knight on b4. Sitting in Tal’s chair, most masters would have rescued the attacked light-squared bishop by counterattacking with 16. c5 and then playing 17. Bc4. But the Wizard of Riga has some magic in mind! Of course, every other possible move would have been catastrophic. You can’t blame Portisch for not being fond of his position after 17… . Be7 18. Bg6+ Kd8 (if 18… . hxg6?, 19. Bg5 Qc7 20. Re1) 19. Bf5 Qxd4 20. Bf4 Re8, but it would have kept him in the game. Tal threatens 19. Bd6, checkmate. If black had saved his queen with 19… . Qa5, then 20. Re1! would have sealed his fate; for example, 20… . Nxd3 21. Bd6+ Rxd6 22. Qe8 mate. Although black has, in terms of the material point-count, more than enough pieces for the queen, Tal proves that Portisch is lost! Although this move looks anti-intuitive, it is one of black’s best in a bad position. He connects his rooks and heads for the queenside with his king. After 23… . Nxb4 24. Rb1 Rxd4 25. Qg3, Portisch’s position would have been pitiful. Black is understandably eager to eliminate white’s potential queen, but this permits Tal to deliver the coup de grace! 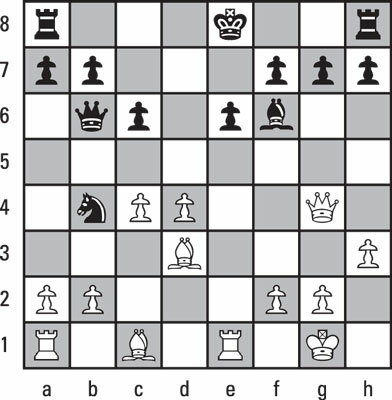 White has one final sacrifice to make in order destroy Black’s position (see the following figure). One last sacrifice is called for. The moves 27… . Nxf6 28. Qxg7+ would also have cost black a rook and the game. Adolf Anderssen (1818–1879), Germany: Although the title of World Champion wasn’t established during his day, Anderssen was arguably the best player of his time and deserves consideration as an honorable mention. Max Euwe (1901–1981), Netherlands: World Champion in 1935. Vasily Smyslov (1921–2010), Russia: World Champion in 1956. Tigran Petrosian (1929–1984), Russia: World Champion from 1963–1969. Boris Spassky (1937–), Russia: World Champion from 1969–1972. Vishwanathan Anand (1969–), India: Undisputed World Champion since 2007. Vladimir Kramnik (1975–), Russia: World Champion from 2000–2007.